Your room includes all the furniture you will need! A bed (twin XL), dresser, bookshelf, chair, and night table is provided for each occupant. A desk lamp is available on a sign-out basis. Sheets, blanket and pillow are also included. All rooms have a telephone jack, cable outlet and internet access. Residents live in double occupancy rooms (with a roommate) or single occupancy rooms (as available). Rooms are approximately 175 square feet in size. 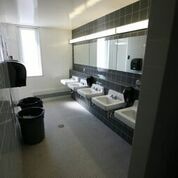 Each floor in Darrach Hall has a large central communal washroom. Darrach Hall features a large TV/Games room. Laundry facilities are located in the basement. Darrach Hall is well known for its community spirit. 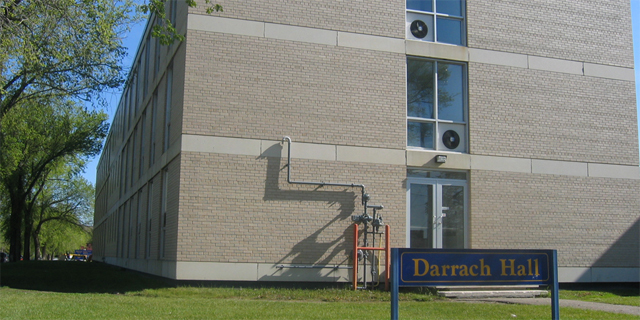 Each year Darrach Hall teams dominate in the intramural sports program, and for two years in succession Darrach Hall residents have won the annual Inter-residence Canadian Blood Services Donation Competition. PLEASE NOTE: Due to fire and health concerns upholstered furniture may not be brought into the residence. This means that if you want to put an upholstered chair or couch in your room, or bring your own bed, mattress, or futon, it must be new, and this must be confirmed by presenting to residence management the original, dated receipt. If, for health reasons, you require an exception to this policy, contact the Director of Residence Hall Programs at least two weeks prior to your anticipated check-in date. PLEASE NOTE: There is NO SMOKING in the Residence Complex.